Description: A first for me, NS 976 (an MT6) is mixed in this NS lashup headed north from Attica Jct. Description: NS 8346 leads a Bellevue bound freight through Attica Junction in a driving rain. 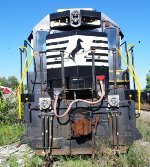 Description: Former CR 6947 is seen in Enola Yard at Enola PA. Description: NS SD38 3813 and GP38-2 5217 moving a cut of stone cars. Description: NS 054 with the FRA inspection car checking the tracks between CP Lees Cross Roads and CP Carl. Got the shot coming and going. Description: Another one of the many units awaiting scrap. Description: NS 3813 SD38 at Cresson Steel to be scrapped. Description: 3813 is going to be the last to get scrapped so get your shots. Description: Waiting to be scrapped.